Once the excitement of the holidays ends, and the thick of winter sets in, it's easy to get stuck in a funk. With little to no signs of spring, it's hard to imagine that warmer weather and happier days will ever be a reality again. When cold weather, short days, and gray skies are the norm, it's essential to have something big to look forward to. There's a reason spring break exists. It falls at the time of year when there are no national holidays where you get a break from work or school. The winter weather has long run its course, and the spring weather hasn't quite touched down yet. Do you need a better excuse to get away? For the past few years, as part of their Christmas present, my husband and I have been gifting our daughters a spring break trip. Two years ago, we went to Phoenix and Tucson, Arizona. Last year's trip was parlayed into a trip to Salt Lake City, Utah for my nephew's wedding. This year, we are heading to San Diego, California. A trip somewhere warm gives all of us something to look forward to when we are in the doldrums of winter. 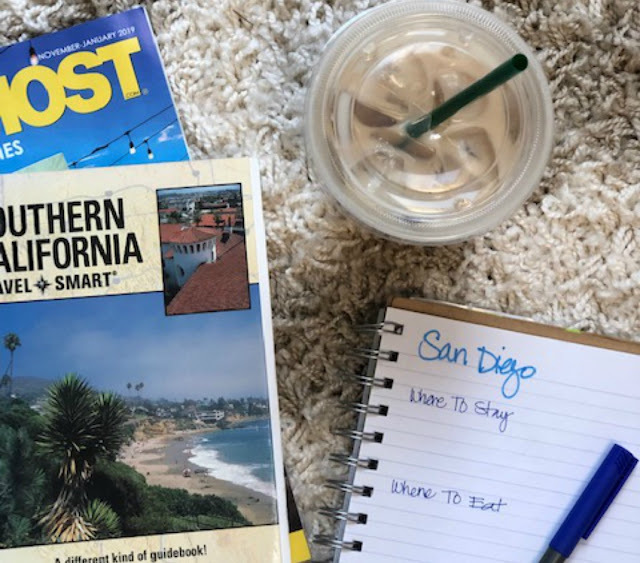 A spring break trip takes some careful budgeting and planning to pull off. Here's how we do it and how you can too. I often hear people say that they book their spring break trips at the last minute after impulsively deciding to go away. If possible, book airfare and hotel at least 3-6 months in advance to avoid unnecessary fees. After we returned from our annual trip to Florida in November, we decided that we wanted to take the kids to California. We immediately started researching flights and hotels and began saving for the trip. You have more flexibility if you are driving rather than flying, but advanced prep and planning is always a good idea. We are fortunate that my husband travels A LOT for business. He accumulates points quickly. If you have accrued points, use them wisely. Rather than splurge on a corner suite, we'd rather add a day or two on to our trip. If you are planning a short stay, however, a room upgrade may be worth the extra points. Many hotels offer special packages that include free or discounted admission to local attractions, restaurant discounts or vouchers, and hotel services, such as spa treatments, etc. When bundled with the room rate, these packages can save you hundreds of dollars. Experiencing the food of any destination is a huge reason why I love to travel. Restaurants are notorious for jacking up dinner prices. Often you can get the same or similar entree for lunch at a fraction of the price. Decide what restaurants you want to try and make reservations in advance. Be sure to ask if there are lunch specials, one that might include a tasty cocktail or dessert. Jetsetting isn't always a feasible option for everyone. When you can't hop on a plane and get away, play visitor in your hometown and/or a nearby town. I live along the New Jersey coast. Any of the neighboring coastal towns would make a suitable getaway, but if we are looking for a complete change of pace, Philadelphia, New York, and Washington, D.C. are just a short drive or train ride away.